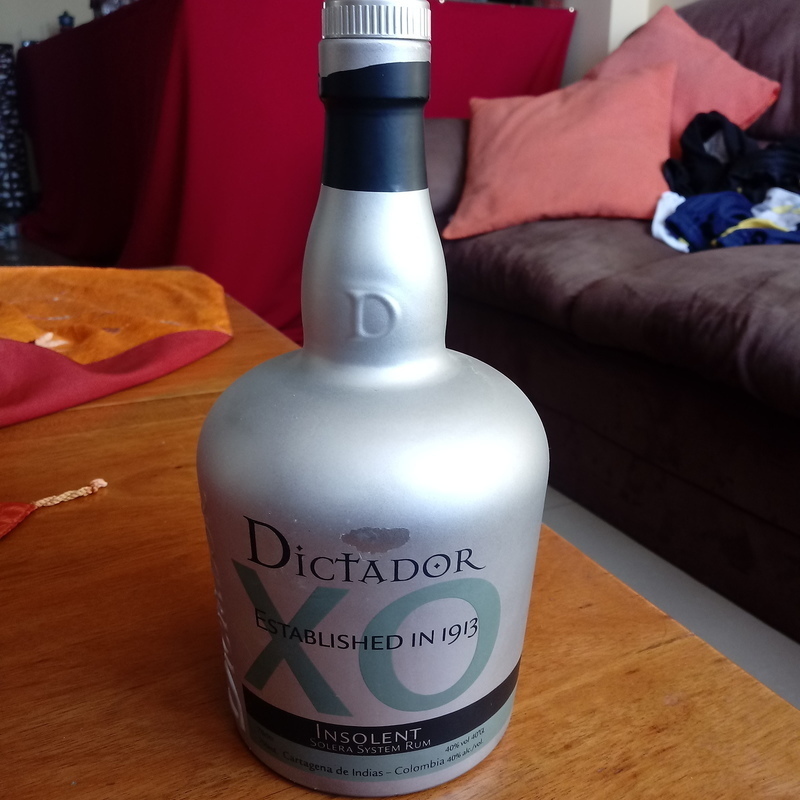 Have you found an online vendor selling Dictador XO Insolent? I had this rum as well as the Dictador Perpetual on my wish list ever since I got a bottle of their 20-year rum at Dorignac's in New Orleans. I found this bottle (and a Perpetual) at Total Wine and More in Jacksonville, FL. I am so glad I got it. First off, the color of the rum is a gorgeous mahogany..deep and rich. Excellent legs and a most wonderful aroma in my snifter. Honesty, no rum in my history of sampling tastes quite like this. I've seen the testing results and this is not a sugared rum but on the outset there is a wonderful subtle sweetness along with the closest-to-perfect vanilla/toffee flavor I have ever tasted. Further sippings give me a little cinnamon/sugar buttery toast flavor. This comes as close to a 10 as I will consider. Burn? Not even a major warmth. This rum envelopes you in a cozy blanket in the throat. No burn. The finish is a tad dry with the vanilla/toffee flavor even more predominate but not overwhelming. Whomever is the rum-master behind this specific rum deserves major kudos. I would love to shake his or her hand. AWESOME!!! Mixing rum? Perish the thought!!! This is a sipping rum through and through. Nothing else. Next time I'm in Jacksonville, I am getting at least one more bottle to have on-hand. If you come across a bottle of this, get it. It's worth every penny of the $100 USD. This is one of the best rums I have ever tasted. I think I have found my new favorite rum. Personally speaking I cannot give any rum a 10 because I do not believe a perfect rum exists. The late great Vince Lombardi once said, "Gentlemen, we are going to relentlessly chase perfection, knowing full well we will not catch it, because nothing is perfect. But we are going to relentlessly chase it, because in the process we will catch excellence. I am not remotely interested in just being good." Back to solera rum for these both Dictador rum from Columbia. Starting by Insolent : Beautiful and deep dark color. The coffee, vanilla, honey, caramel are present. Also agree with butterscotch aroma. Sweet and long finish. A very good one and should be on your collection. I had this side by side with the Dictador Perpetual, and to me, this was much better. This has a sweeter, more rum-like flavor to it. Honey, toffee, caramel, vanilla, and a hint of anise. Beautiful smell! This is definitely my favorite of the Dictadors! Wenn Du das Glas zur Nase führst, sagen Deine Sinne: Ich will mehr ! Einfach nur fantastisch ! Nicht für Jedermann ! Sehr dominant ! Ein Diktator ! In der Nase Holztöne, Ledernoten, dunkle Schokolade, wie beim 12 Y oder 20 Y, nur intensiver und viel harmonischer. Wunderschönes dunkles Mahagoni im Glas. Im Gaumen wird es sehr komplex, schwarzer Kaffee mit Gewürzen, Toffee, gebranntes Karamell, auch die Holznoten spielen in diesem Orchester der Geschmäcker mit. Der Abgang will nie enden, dunkle Schokolade, dunkles Holz, sehr schwer. Ein sehr spezieller Ron der Zeit und Raum braucht und sich auch nimmt um seine Geschichte zu erzählen. Super an kalten Wintertagen, im Sommer zu deftig. If you bring the glass to the nose, say your senses: I want more! Just fantastic! Not for everyone! Very dominant! A dictator! In the nose wood tones, leather notes, dark chocolate, like the 12 Y or 20 Y, only more intense and much more harmonious. Wonderful dark mahogany in the glass. In the palate it becomes very complex, black coffee with spices, toffee, burnt caramel, also the wood notes play in this orchestra of tastes. The finish will never end, dark chocolate, dark wood, very heavy. A very special Ron who needs time and space to tell his story. Great on cold winter days, in the summer too hearty. Coffee and anise dominate. The anise is usually a dealbreaker for me, but in this case, it's ok. I know what the testing says, but this is cloyingly sweet. After trying a bottle of 20 year solera from Dictador I thought I would give this a go. Unlike the 20 year old, this one has a subtle aroma. It is sweet but the flavor and smoothness is absolutely incredible. A must try. 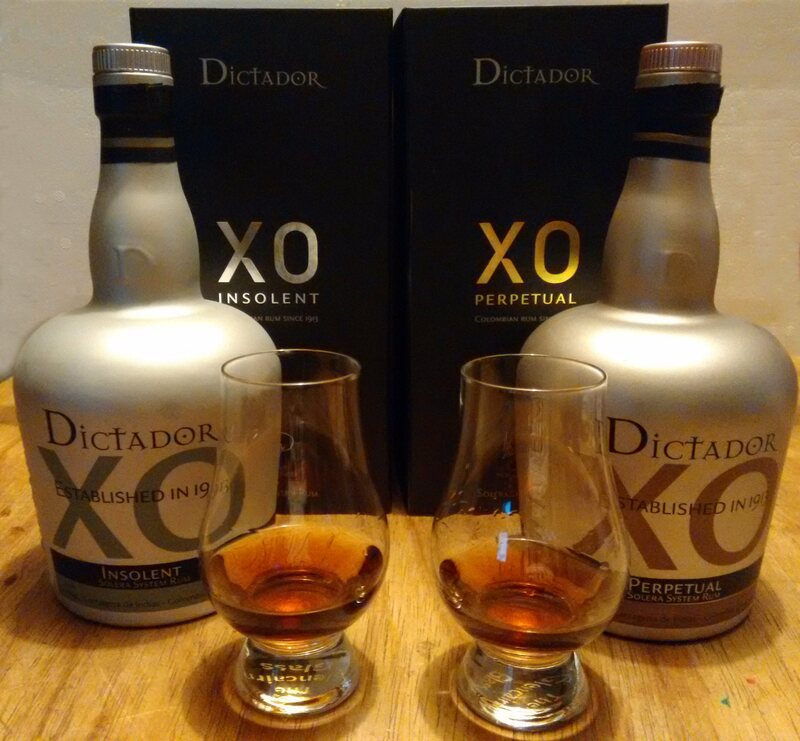 Dictador XO Insolent smells delicious with sweet toffee, mocha and vanilla. You also sense some oak, spice and raisins. Let the rum rest in the glass for a while and the great aromas gets even better. In the mouth you get flavours of oak, spice and wonderful sweet flavours like vanilla, nuts and toffee. You also can find flavours of coffee and orange. In the throat this rum is like velvet, so smooth. The flavours of oak, spice, vanilla and toffee is still there and you also sense them in the long and smooth aftertaste. A high class sipper that I recommend to drink neat. I was happily surprised when I tasted this rum. There are a lot off different opinions of this rum so I was a bit unsure before I tasted it. But now I am certain that the Dictado XO Insolent will be one of my favourites for a long long time. GREAT rum, smooth from start to finish. Nice smooth Port finish. Definitely a rum to keep on hand.. Stand by to hand over your kidney cause this guy will set you back a firm $100.00. Definitely one of the best rums in my cabinet.. complex as it gets..
Ochutnán ve srovnávacím testu s D 12, D 20 a XO Perpetual. Shrnutí: Hodně zajímavý rum, jen škoda, že ( z mého pohledu) chuť nedosahuje kvality vůně. Příznivci stylu Dictador si i tak přijdou na své. What a Rum ! Balanced balanced balanced. Sweet sweet sweet ! I bought a bottle after seeing it rated so highly by online reviews. Thought it had a taste I couldn't put my finger on. Re-read some reviews and agree it is like a butterscotch/toffee. Smooth though, no burn aftertaste. I have less expensive rums which I think taste much better. Paid $100 US for the bottle. If I were a coffee drinker it would be perfect. Thus the 9. Neat: Wonderful vanilla toffee with hint of cinnamon. Some butterscotch. A hint of coffee aroma and taste. Nice after notes. My kids are going to love this. Oh and I may start drinking coffee. Absolument indessament bon ! Le meilleur rhum que j'ai goûté. I like this Insolent XO but I prefer the much cheaper Diplomatico Exclusiva Reserva. For the money I expected more from this rum. Smooth... and much to my surprise, I quite enjoyed the caramel. I will definitely buy another when I see one. Con La Hechicera y Parce, los mejores rones colombianos. Un balance muy agradable. Pura miel, como para tomarlo en pequeños sorbos. A wonderful sipping rum with lovely strong but not intrusive vanilla and butterscotch notes. No burn whatsoever. Don't miss out on this one. Really enjoyed this but not sure I’d keep it in the regular rotation based solely on the price. Very unique Carmel/butterscotch flavor & absolutely zero burn on the back end. What a nice caramel taste! Definetly something you should try! Purchased a sample from Master of Malt for around the £8 mark. Decent sipping rum with notes of coffee and intense caramel for a powerful nose. Good rum with loads of character! Excellent aroma. An unique. Full taste with touch of coffee, almond or chocolate. I am totally surprised with such a good taste.